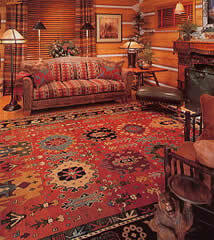 By many, oriental rugs are considered an integral part of any home or office decor. As a starting point or finishing touch, they blend wonderfully with traditional, contemporary, formal or informal decorating styles. They complement the floors and walls and add a unique quality of color, pattern, texture and dimension to any setting. Their legendary durability make them perfectly suited for heavily traveled areas and virtually any surface. They can be used over hardwood, tile, marble or even wall-to-wall carpeting. From the traditional oriental look to the Art Deco, European and contemporary, today's oriental rugs are being woven to suit an infinite number of decorative styles as well as sizes. In addition to the tremendous variety of pile rugs, one can also choose from a large selection of flat weaves, including dhurrie, kilim, chainstitch and needlepoint rugs. There has never before been such a wide variety available for decorating one's home or office.